These versatile generators are perfect for aImost any application requiring steam from 0-100 PSIG. Each unit is complete with automatic features, including pressure and liquid level controllers, ASME Code pressure vessel and safety valve and are fully tested under power. Each one must pass Sussman’s rigid quality control inspection before it is shipped. Strainer, solenoid valve and check valve factory wired and plumbed. 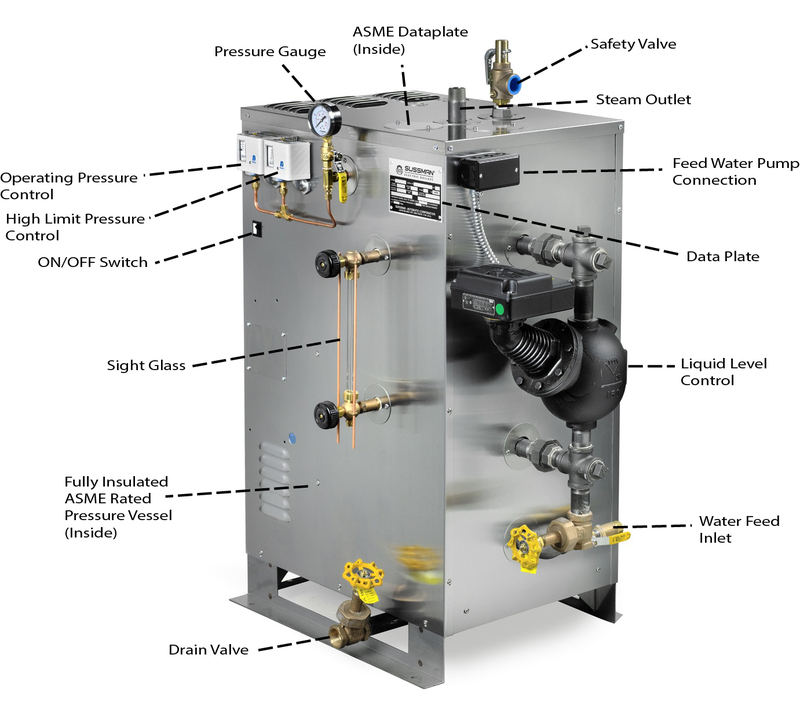 McDonnell Miller No.150 control automatically maintains proper water level, shutting off the boiler when water supply in the boiler drops below a safe operating level. Allows constant observation of water level while boiler is in operation. Allows manual operation of the boiler operating control circuit. Indicates control circuit’s on/off condition. Facilitates emptying the boiler pressure vessel and MM150 water column piping during blowdown sequence. Industrial grade, heavy duty 0.430 inch diameter INCOLOY alloy 800 heating elements, equipped with one piece resistance welded terminations for added strength and safety. Resets automatically to maintain preset pressure within boiler. Pressure vessel insulation minimizes heat loss and maximizes energy savings, insured by fibrous glass material. All control panels and components are easily accessible. Fully-louvered openings avoid component heat build-up. Electrical construction conforms to NEC standards. Automatically opens to reduce pressure should excessive steam cause pressure build-up. Allows visual observation of steam pressure over full range. Provides high limit pressure cut-out with manual reset. Standard electronic back-up to primary MM150 control.